It might seem like a gimmick, but this is a highly practical practise tool and great plugged in for stage or home-recording use. Excellent, futuristic-style design and build. Amplified sounds. There's no tuner onboard here. Designed primarily to be practice tools, Yamaha's Silent steel and nylon guitars are intended to be played with headphones and exhibit virtually zero acoustic sound. 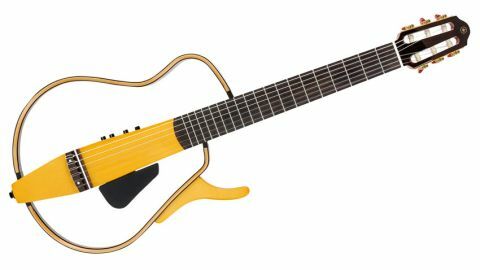 "As many high profile players have concluded: Yamaha's Silent Guitars don't feed back when amplified"
But, as many high profile players have concluded (including Brian May, Lee Ritenour and even Rodrigo y Gabriela), not only do they look pretty futuristic and cool, but when amplified, they don't feed back. This guitar is very well engineered and the neck is beautifully shaped, too. The 'board is ebony like a high-end classical and, bulk aside, the cleverly designed frame makes it feel as though you're playing a classical guitar. The Yamaha features a good low classical string height and wide bridge spacing, although its nut spacing is a little cramped. There's enough acoustic sound for practice in a quiet environment, but that's not really the point. Plugged in, it sounds very good, and although there's a more electric-like sustain, especially from the lower strings, you can see why numerous players actually use these guitars live. The EQ is basic but effective, and the effects are usable, especially the two reverbs and echo. Of course, if your style includes any percussive body slaps, you can't do them here.